Do the twist! This top is simple but packs a fun surprise. The dolman sleeved blouse is a flattering top meant for light weight drapey knits that are the same on front and back. 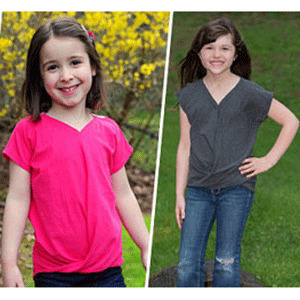 The neckline features a gradual v-neck that is a breeze to sew. The back of the blouse can feature a special fabric such as stretch lace or a really cool scrap of knit you’ve been hoarding for years. The surprise in this blouse is the twist at the front. The shirt-tail hem really makes this top a great choice for just about any pants or skirt style. 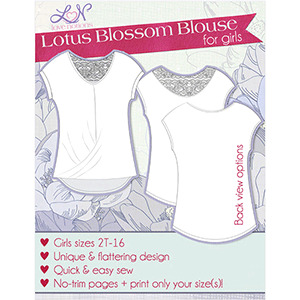 This is the girls version of the Lotus Blossom Blouse. 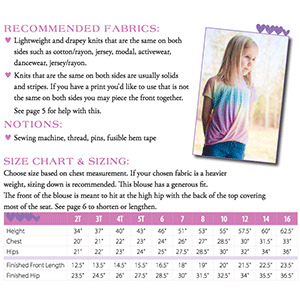 This pattern comes with sizes 2T to 16. 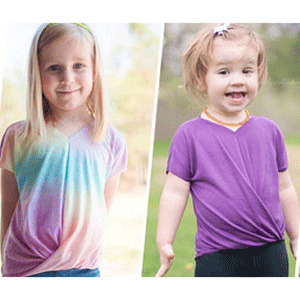 Suggested fabrics are knits such as cotton lycra, lycra spandex or cotton jersey that is the same on both sides.